Article Reprinted from Moment Magazine with permission. This February, a banner was raised in Dahlonega, Georgia. The banner, falsely, proclaimed the downtown building it was on a historic hall for the Ku Klux Klan. It provoked instant backlash. Reading about this event in the news following the uproar, I learned of a small Jewish community in Dahlonega: Shalom B’Harim. I went down to Dahlonega to write about their reaction to the banner, and the story was published in Moment’s May/June issue. What I didn’t get to do in that story was celebrate the community itself, which is non-denominational, welcoming, and warm. 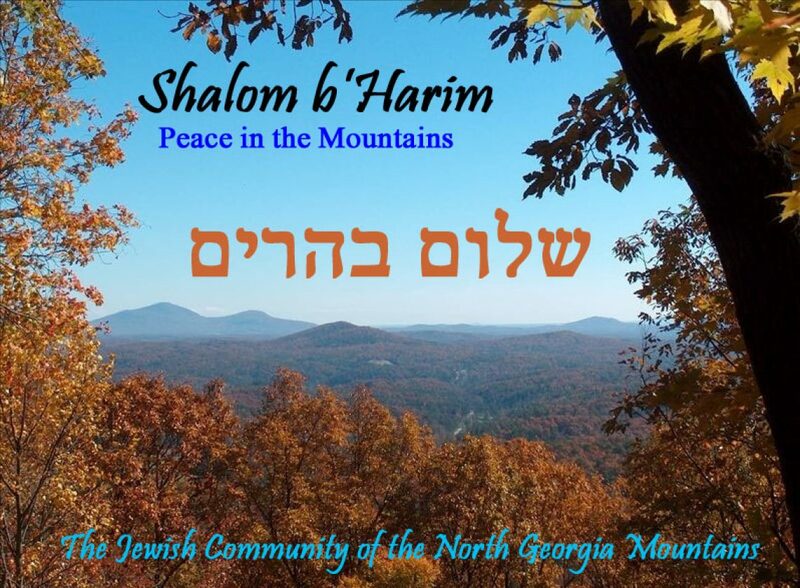 Shalom B’Harim (“Peace in the Mountains”) is a small congregation of Jews in Dahlonega, Georgia, a small town in the foothills of the Blue Ridge Mountains. The group started in 2001 when two local Jewish mothers got together to give their young children access to a Jewish environment closer than Atlanta. Since then they have grown to a group of around 70 members, with around 30 regular attendees at their monthly Friday night Shabbos services. 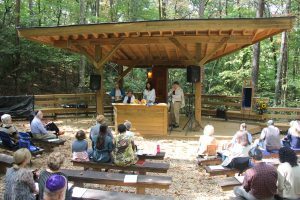 Aside from a new social group on the other side of a mountain, Shalom B’Harim is the only Georgia Jewish congregation that meets regularly north of North Fulton and Cobb Counties. There are 3,500 Jews in the 20 northernmost counties in Georgia, comprising just 0.41 percent of the total population, according to the Steinhardt Social Research Institute at Brandeis University. While Dahlonega is reportedly a pleasant and welcoming town, skinheads and white supremacists do sometimes make some skittish. Dea Devereaux is a member of the Dahlonega Presbyterian Church and a frequent attendee of Shalom B’Harim’s services. She says that despite unpleasant incidents every couple years, such as the raising of a Ku Klux Klan banner downtown in February, Dahlonega is a very harmonious place. “This is a beautiful place. It’s a mountain community that’s full of love and inter-ministry situations, and neighbors helping neighbors,” says Devereaux. “In all my years I’ve never seen any white sheets or anything. Obviously where there’s humans there’s going to be different opinions. My deal is, you don’t try to convince me of your way, and I won’t try to convince you, and we live and let live. It’s up to the Big One anyway. Around ten years ago Shalom B’Harim received a Torah as a “permanent loan” from a congregant’s family. The Torah is about 150 years old, and purportedly survived the Holocaust in Czechoslovakia. The Torah is kept in a wooden case built by Stan Applebaum, referred to affectionately as Shalom B’Harim’s mishkan. Between monthly services Applebaum takes the Torah home, or Cohen takes it to use for bar mitzvahs and weddings further south. The group also gets occasional visits and assistance from Rabbi Matt Dreffin, of the Institute for Southern Jewish Life. In addition to running a museum in Jackson, Mississippi, ISJL provides rabbinic and educational programming throughout 13 states in the American south. Mike and Deborah Arnold live in Dahlonega as well. While they were concerned about the banner incident as well as the recent uptick in hate crimes nationally, they think north Georgia has gotten much more tolerant over the years.